Low humidity is especially prevalent in the winter as cold air doesn’t hold much vapour. The colder the air, the drier it is and it gets into your home through drafts, leaks, holes, poor insulation or is pulled in through ventilation fans. Heating that dry air only makes it drier. High home humidity is more common in the summer as the weather brings high levels of moisture. Living in a dry home can increase your risk of catching a cold, cause dry skin, and damage wooden furniture and materials. While the effects of a humid home include a higher risk of mould, the proliferation of dust mites, and negative effects on your well-being such as a lower quality of sleep. If your house or flat is too humid you should ventilate your home and rooms better by opening your windows several times a day, leaving them open for 10 – 25 minutes at a time. Another simple technique is to fill some bowls with salt and place them in the more humid areas, such as by a radiator, to absorb moisture. For those whose homes are too dry, some simple recommendations include leaving the bathroom door open, hanging a water container on a radiator, and getting some house plants such as sedge, spider, African hemp, and papyrus. You could of course also purchase a humidifier or dehumidifier to improve humidity levels. Great Britain fairs well in comparison to Germany, Italy and Spain where home humidity levels leave much to be desired. 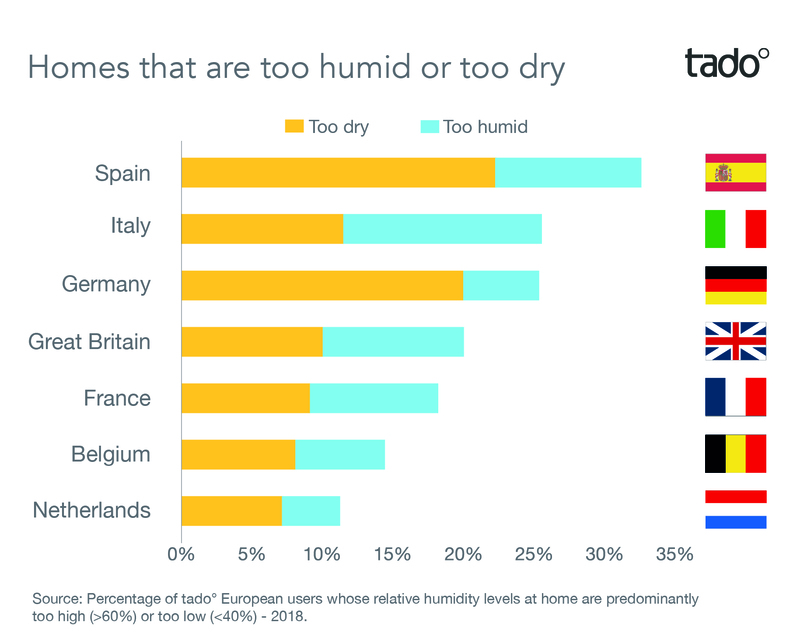 *Figures based on the home humidity levels of several hundred thousand tado° users across Europe. The humidity of your home should ideally be between 40% and 60%. However, there are differences between different areas of your home.